When you do work around the house or at your construction site, you need to be able to reuse your tarps. Since the world economy is not in the best condition today, you definitely do not want to have to replace your coverings every time you do a new job. But an ordinary task will sometimes result in a tear. Your solution in this and many other cases is tarp tape. 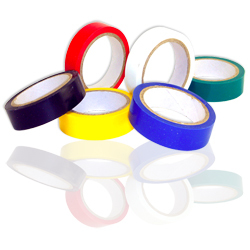 This adhesive tape can be found in many colors, matching your covering if you choose. You might also want to contrast sharply with the color of your tarp. The reason for this is you can use the tape as a reinforcement agent, strengthening certain key points on the tarp so it can lay over a corner or sharp point without risk of puncture. It is better if you can easily see where the reinforced areas are. Many types of this adhesive is water proof. This means that when you repair tears you are making the whole piece water resistant once more. Which is good news if you plan to protect your floor from a spilled can of paint. If you are working outside, this taping solution is essential in keeping your coverings in place. The wind can wreak havoc with a painting project if your coverings start flapping around. Taping will solve that problem easily. When the time comes to work on a huge area, sometimes one covering is not enough. When using multiple coverings together, it is best if they do not separate and leave spaces where paint can still do damage. Taping your big pieces together prevents this possibility. It is apparent, then, that tarp tape plays an essential role in keeping your work projects safe and effective. You can use it in other projects, as well. And when it comes time to store your tarps, what better way to keep the bundles together than with some well placed tape. The tarp tape works best with poly tarps.